As expected, the Senate has confirmed former Oklahoma attorney general and walking conflict of interest Scott Pruitt to be the next administrator of the U.S. Environmental Protection Agency. If President Trump still plans to cripple the EPA, as he repeatedly promised during his campaign, the man to lead that effort begins work on Monday. Pruitt will be tasked with making the EPA great again by dismantling climate programs and slashing funding for things like the enforcement of the Clean Air Act and Clean Water Act. The 52 senators, led by Senate Majority Leader Mitch McConnell, who voted “yea” have much to answer for. Today, threats to clean water and air put millions of Americans at risk. We’re also running out of time act decisively on climate change. Putting a climate denier in charge of the federal agency in charge of climate policy is like pouring gasoline on a burning house. The vote came down along party lines, except for Senators Joe Manchin and Heidi Heitkamp, both of whom are Democrats from coal-producing states. Not coincidentally, both senators also attended President Trump’s signing of a bill to overturn the Stream Protection Rule yesterday. Maine Sen. Susan Collins was the only Republican to break from her party. Pruitt disqualified himself from effectively leading the agency long before being nominated by then President-elect Trump. 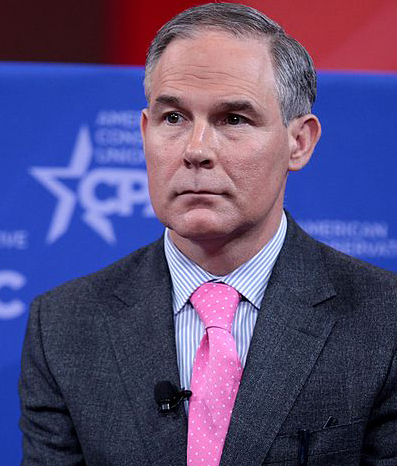 During his seven-year stint as attorney general, Pruitt sued the EPA no less than 14 times. Siding with industry in every case, his goal seems to have been sinking as many federal rules as possible — ozone limits, limits on power plant emissions of mercury and carbon dioxide, clean water protections, scenic protections for national parks, to name a few. Following his nomination, Pruitt caught flak describing himself as “a leading advocate against the EPA’s activist agenda” on his LinkedIn profile. As of today, a few hours after the confirmation vote, that proud proclamation is still on his page. I checked. And, really, why would he feel the need to downplay his opposition to the EPA’s mission? He’s received ringing endorsements from members of Congress including the majority leader. “Pruitt is just the candidate we need at the helm of the EPA,” Sen. McConnell said today. Republican senators heaped praise on Pruitt during his confirmation hearing for his attempts to hamstring the EPA and for being a good baseball player — a quality some Democrats on the Senate Environment & Public Works Committee turned on him in calling out his losing record in lawsuits against the EPA. This also isn’t Pruitt’s first time in the national spotlight. He was the subject of a 2014 investigation that exposed his secretive ties to the oil and gas industry. The investigation famously revealed that, while attorney general, Pruitt took a letter drafted by lawyers for Devon Energy accusing the EPA of overstating the problem of air pollution from natural gas drilling in Oklahoma, changed a few words, slapped it on official letterhead and sent it to the EPA with his signature. “Outstanding!” a Devon Energy lobbyist replied. The controversy du jour — because every day it’s something new — relates to emails and other documents detailing communications between Pruitt’s office and the oil and gas industry. The day before Pruitt’s confirmation vote, an Oklahoma court ruled in favor of the Center for Media and Democracy and ordered the release of as much as 3,000 emails that would presumably be of interest to senators weighing Pruitt’s confirmation. We should keep in mind who the real protectors are as Pruitt takes his position atop the agency tasked with safeguarding our air and water.